Deliver smiles and do it in under two minutes for less than a dollar! 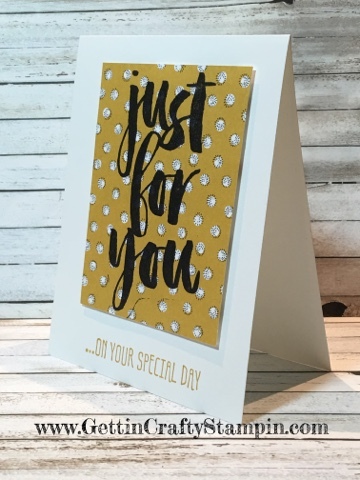 This hand-crafted card is perfect to do this while celebrating many of life's joys. With the new Free Sale~A~Bration stamp set and pretty paper that is available for a limited time. I hope you enjoy this cute and quick Video Tutorial. Join Us in creating pretty hand-crafted cards in our card making classes. A wonderful collection of pretty paper - this Wildflower Fields Designer Series Paper is just so very pretty! I adore that it is FREE for a Limited Time with a minimum purchase during Sale~A~Bration. With these little puffs of nature on a Hello Honey In-Color the Black Archival ink pad really pops. This Botanicals FREE Stamp Set is universal in celebrations! Here the Just For You in black pops with the coordinating Hello Honey In-Color ink pad stamped ...on your special day. 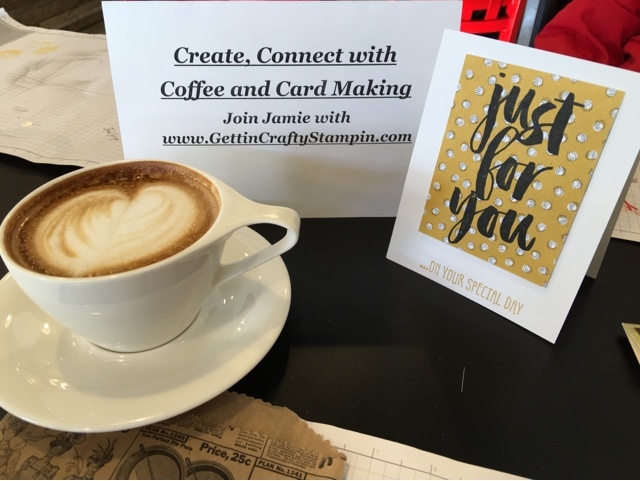 We created this at our Free Card Making, Connecting and Coffee class this morning (we create a free card each Monday morning!!) at Ragamuffin Coffee Roasters. 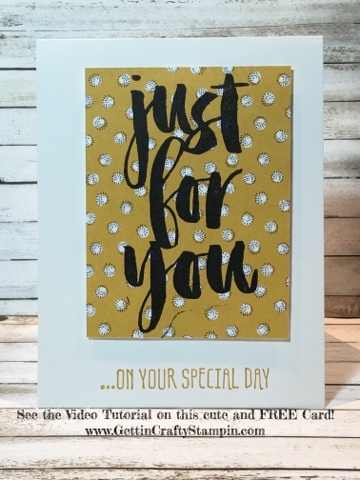 See this Video Tutorial on this pretty and quick 2 minute card making tutorial! Cute, quick, creative while created as we connected over coffee and it's UNDER a $1 to make (whew!). I LOVE Free - and this Free Stamp Set and Free Pretty Designer Series Paper make this card extra awesome! Create with me - pick a Private Class and let me bring the crafting fun to YOU and a Shopping Spree. Pick a Class that is waiting for YOU. Join me as #ImBringingBirthdaysBack and send cards to those in your life (or let me send YOU a card! ).